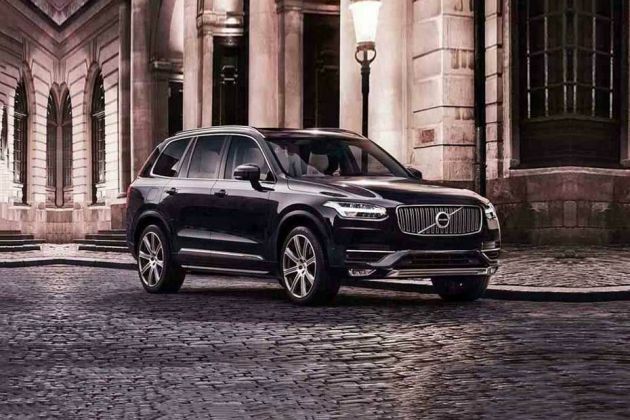 The all new Volvo XC 90 is the latest entrant in the huge automobile market of India. It is a sports utility vehicle available in two variants of which, Volvo XC 90 D5 Inscription is the top end trim. This particular variant is bestowed with some interesting aspects such as the air quality system, heated front seats as well as panoramic sun roof that is power operated. Besides these, it also has ticket holder, grocery bag holder, cup holders and a few other such utility aspects that enhances the level of convenience. All the well cushioned seats in the cabin are covered with premium Nappa leather upholstery. Headrests in the rear can be power folded, while the memory function to front seats are a major advantage. The entire cabin looks simply elegant with an attractive color scheme, whereas the linear walnut décor inlays gives luxurious feel. Moreover, the extensive use of high quality leather for gear lever knob, and steering wheel further makes it look quite classy. On the safety front, this trim comes with whiplash protection for front seats, hill descent control, ABS, child safety locks and a few more in the list. What powers this robust vehicle is a 2.0-litre diesel engine, which displaces 1969cc and delivers an excellent performance besides giving a decent fuel economy. Built based on the brand new Scalable Platform Architecture (SPA), this SUV certainly keep everyone spell bound with its amazing design and looks. The large radiator grille at front is definitely the main attraction in its front facade, whose horizontal slats are polished with chrome. Moreover, the big and stylish logo of the company in between the grille, highlights it further. A pair of fog lights in front spoiler adds to the visibility, whereas the wide windscreen comes fitted with a pair of wipers. The design of its large headlight cluster looks quite refreshing and it includes LED headlamps. On the sides, its 20 inch, ten spoke diamond cut alloy wheels surely remains the head turner. The retractable outside mirrors, door handles as well as chrome garnished window sill are other noticeable aspects in its side profile. On the other hand, its rear end is carefully designed by the firm and one can notice some remarkable features here. The trendy tail light cluster comes integrated with turn indicators and the windscreen has defogger. A wiper is also integrated to it, while the spoiler above, further adds to its style. Other aspects like the well sculpted bumper, dual exhaust tail pipes and a pair of reflectors gives a complete look to its rear profile. This trim will definitely make every customer mesmerized with its splendid interior design and appearance. The use of linear walnut décor inlays, dual tone color scheme as well as black color on headlining altogether, is quite rejuvenating. Besides these, the chrome inserts on several equipments inside, gives a rich look. The steering wheel in a three spoke design, is finely wrapped with premium leather and the sophisticated instrument cluster, provides required information to the driver. The well cushioned seats incorporated in this variant, get Nappa leather upholstery. Both the seats at front are power adjustable in four different ways and have memory function. Meanwhile, the third row seat comes with foldable function. This stunning vehicle is incorporated with a 2.0-litre diesel engine that has 1969cc total displacement capacity and based on double overhead camshaft valve configuration. It carries four cylinders, which are further integrated with sixteen valves. The firm has incorporated it with a common rail direct injection system and paired with an 8-speed automatic transmission gear box, which drives engine power to all its wheels. The maximum power it generates is 225bhp at 4250rpm, whereas its peak torque output comes to 470Nm in the range of 1750 to 2500rpm. This motor allows the vehicle to accelerate from 0 to 100 Kmph in 7.8 seconds and attain a top speed of around 220 Kmph. Furthermore, it gives a maximum mileage of around 17.24 Kmpl, which drops down to nearly 13 Kmpl when driven within the city. All four wheels of this trim are fitted with a robust set of disc brakes, which function exceptionally well. These are further accompanied by anti lock braking system, which just boosts this mechanism. It is bestowed with an air suspension system that includes Four-C electronically controlled damping system. This suspension system also features separate air chambers, which are controlled by a computerized compressor. Besides these, its speed sensitive power assisted steering column ensures better handling and allows the driver to drive through rough roads while maintaining good stability. The number of comfort features in this variant, certainly provides an enjoyable driving experience to its occupants. It has a four zone automatic air conditioning system featuring electronic climate control. The windows in its rear have sun blinds, whereas the heated windscreen comes with washer nozzles. The power operated panoramic sun roof lets in fresh air and sun light. Another best thing about this trim is its advanced audio unit that supports AUX and USB connections. It features premium sound system by Bowers and Wilkins that have 19 speakers and gives a total output of 1400 watts. This unit also includes a CD player in center console storage, navigation and CarPlay preparation as well. The lumbar support to its front seats, center armrest with cup holders, ticket holder, automatically dimmed inner and external mirrors, power operated tail gate, graphical head up display, are a few others in this list. All the models from this brand are mainly known for their advanced safety features, which guarantee maximum protection of its passengers. Some of these include automatic height adjustable front seat belts with pyrotechnical pretensioners in the front and rear, anti lock braking system, intelligent driver information system, SIPS airbags and inflatable curtains, 2 step front airbags, and hill descent control. In addition to all these, the company has also loaded it with park assist camera, tyre pressure monitoring system, cut-off switch passenger airbag, hill start assist, interior motion sensor for alarm, power child locks for rear doors and many other such aspects. 1. Its stunning external appearance draws a lot of attention. 2. Big ground clearance is one of its main plus points. 1. Cost of maintenance is very high. 2. Rear head space can be a bit more in dimension.